After a 7–9 season in 1997, no one gave coach Dan Reeves’s 1998 squad a chance. But on the legs of running back Jamal Anderson—who rushed for 1,846 yards, nearly twice as much as he ever had or would again—and a smothering defense, the Falcons rattled off a nine-game winning streak to end the season a franchise-best 14–2 atop the NFC West. During a Week 15 victory over the hated ’Aints, Reeves suffered chest pains and eventually underwent open-heart surgery. The beloved coach was back on the sideline in time to engineer two playoff wins—the second an overtime upset over the juggernaut Vikings that sent Atlanta to its first-ever Super Bowl against the defending champions, the Broncos. The wind was promptly sucked out from beneath our wings as Reeves’s old nemesis, John Elway, threw for 336 yards in a sound 34–19 Bronco stomping. 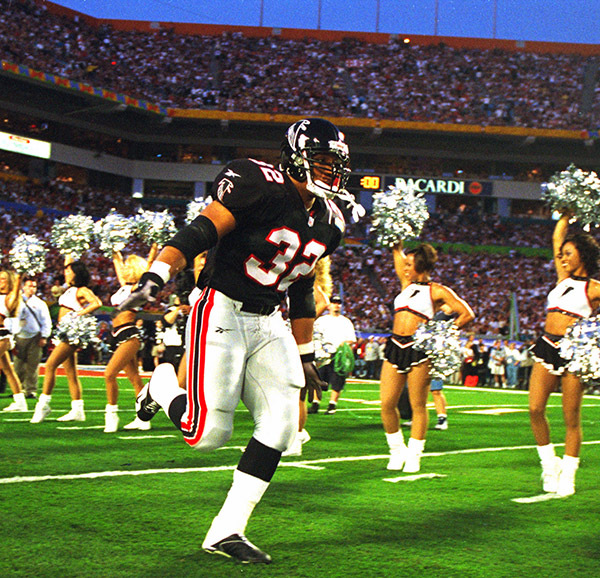 Hopes soared the following year, but Anderson blew out his knee, and the Falcons crawled to a 5–11 finish. And of course, they haven’t returned to the Super Bowl since.